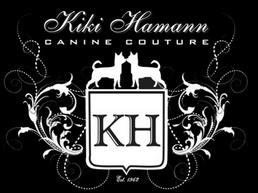 Dog fashion designer Kiki Hamann will debut her winter collection on November 19, 2011, at the Mayfair Hotel and Spa in Coconut Grove, Florida. The Sophisticated Collection by Kiki Hamann Canine Couture targets smaller breeds of dogs but customizable items for all breeds are available. The Kiki Hamann Canine Couture line of items is crafted by hand and feature harnesses, handbags, apparel, and limited edition products. In conjunction with fellow designers Uberto Gucci and Baron Siamanto, Kiki Hamann will be fundraising for the Friends Forever Humane Society, a part of the Maddie’s Pet Rescue Project of Miami, Florida. The two groups represent a coalition of humane organizations in the Miami-Dade Country in an effort to end the euthanasia of dogs and cats in county shelters. At the November 19 event, Italian Designer Uberto Gucci will launch the collection, “La Collaborazione.” Gucci’s daughter, Drusilla Gucci, will walk the runway with the family Chihuahua. Human models in the show will be outfitted by Baron Siamanto, who will be bringing his rescue dog, Chala, to walk the runway as well. Hamann has retailers of her line in many countries, including Germany, Switzerland, Brazil, Norway and Australia. Materials she works with include leather, suede, faux fur, fine lace and silk. The line targets the stylish dog lover and does not include mass produced items. The event begins at 8:30 p.m. with a $50 per person advance ticket price; $100 at the door. Proceeds of the event benefit Friends Forever Humane Society. Tickets may be purchased by contacting Rita at (305) 491-5651. Connect with Kiki Hamann on her website, www.kikihamann.com, or on Facebook at www.facebook.com/KikiHamann.